I like mayonnaise. I am not proud to say it, but I like the taste of mayonnaise. However, in my journey to eat whole, gmo-free foods, I have found that I am unable to consume it with a clean conscience. Here are the ingredients in Hellman’s Mayonnaise: Soybean oil, whole eggs, vinegar, water, egg yolks, salt, sugar, lemon juice, natural flavors, calcium disodium EDTA (used to protect quality.) Now, prior to learning so much about oils and soy, I would have thought that these ingredients don’t seem so bad. However, now armed with the knowledge of the health affects of soybeans, I avoid products with soybean and soybean oil like the plague. (http://articles.mercola.com/sites/articles/archive/2010/09/18/soy-can-damage-your-health.aspx) So, I set out to create an egg salad free of mayonnaise, which at first I didn’t think possible, unlike a light bulb went off (and a quick google search.) I found that some recipes for egg salad replaced mayonnaise with greek yogurt. I decided to create my own egg salad that would please me and my boys without missing the mayo. Here is what I created and I got approvals from my husband and boys and they didn’t even realize I hadn’t used mayonnaise until I told them after they were about halfway done with their sandwiches. Boil 8-9 Eggs (preferably pastured eggs) and peel. You can chop up the eggs in a food processor but I prefer doing everything in one bowl because it means less dishes! I cut the eggs with a knife and fork right in my bowl. Depending on your preference, you may want to add more greek yogurt, if you prefer it more moist. It really is a pretty customizable recipe but the important thing is that the mayo is out and the greek yogurt is in! I sometimes use Old Bay Seasoning or yellow mustard for my egg salad. 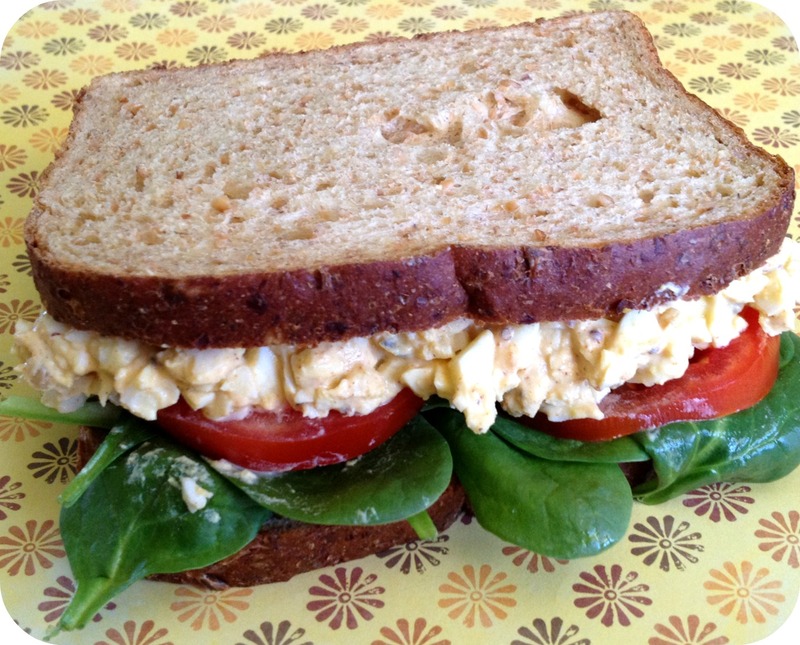 Serve your egg salad on a bed of lettuce, garnished with tomatoes or on toasted, sprouted, whole grain bread (as shown below) with spinach and tomatoes. Mayo is one of the last things I’m having trouble totally eliminating. We don’t use it very often, but there are times when that is exactly what I want. I found a recipe for olive oil mayo that I want to try out soon. I love using Vegannaise from Whole Foods and don’t miss mayo at all. Thanks for the head’s up on Vegannaise. I will have to check it out next time I am at Whole Foods! I used to use Vegannaise until I read the label and saw that it contained canola oil, which I won’t eat. Follow Your Heart’s Vegannaise is AMAZEBALLS. Best one on the vegan market. AVOID NASOYA LIKE THE PLAGUE. I bought a jar two months ago for this white sauce I made to go with a halal cart style chicken dish… SOOOO GROSS. They can be pricey, so Greek Yogurt is also an amazing mayo replacement! Thanks for the tip! I will look for it at Whole Foods! Sounds yummy. A tip when making egg salad, use a cheese grater for the eggs. It keeps the pieces uniform and it is super quick and easy to use. Great recipe! I skipped the dill and and added chopped onion, celery, and green pepper. We ate them as lettuce wraps with black bean chips on the side. Didn’t miss the mayo at all. Thanks! If you want to eat mayo, go for it. Just make your own – you can use high quality, local eggs with practically any type of oil that you’d like and flavor it to your liking. Vegannaise contains soy (albeit non-GMO) and so I’d really prefer to stay away from it. Exactly, I always bought grapeseed oil Vegennaise until i found out that the soy isolate does not say non GMO and truthfulness is not something many companies are bent on delivering. No money in it! Thanks for the idea for not using mayo. The Greek yogurt worked out great. I added some curry powder and tarragon to mine and it worked great, too. Thanks! I’m new to the greek yogurt fad. I tried this and I’m not use to the taste – I dont want to throw out my whole batch, does anyone have a tip to spice it up a little?? Try decreasing the greek yogurt and add a 1/2 of smashed avocado and spice it up with some garlic and onion powders or throw in some bay seasoning. I hope this helps. Enjoy! Awesome, added some celery and red onion. A keeper!! I’m curious what the total calories, protein,fiber and carbs. are for this? I’ve tried this today the yogurt definitely gave it a different taste but I can get used to it. Thanks. I am sorry, I don’t have the nutritional info. May I suggest cutting slightly back on the greek yogurt and adding 1/2 mashed avocado to it. This will maintain the creaminess but lessen the tart taste of the greek yogurt. Definitely loved this recipe! Added a bit more mustard and added a bunch of spices that weren’t listed, butbut they were what I had on hand. It really turned out well!